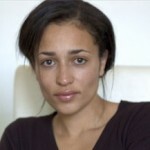 Comments on: "Zadie Smith Quotes: All tastes are expressions of belief." Any woman who counts on her face is a fool. Sometimes you get a flash of what you look like to other people. They cannot escape their history any more than you yourself can lose your shadow.